First time poster and relatively new woodworker (about 2-3 years doing various projects from my growing garage shop). s diluted into my 4th coat or so now. I am not getting an even finish as it appear the grain of these two species feels very open and there are many (what I am referring to as dead spots) in the finish. Now, the table is going to live outside, so I want to be confident the finish is going to provide as much protection as it can, but more importantly I just want to understand what is taking place and see if there are any steps I can go through to mitigate. Attached is a recent photo of the table after wiping down with lacquer thinner. The actually problem is not this bad, but the exaggeration helps to see what I am facing. Any insight is greatly appreciated. I don’t think that lacquer thinner is the right thinner for varathane varnish. You should be using mineral spirits. Getting an even coat of polyurethane on an open pored wood is an exercise in patience. I made a large redwood burl table a few years ago (http://lumberjocks.com/projects/83586) and it took 10 coats of thinned poly with sanding at progressively finer grits between coats to get an even finish. Next time try a thin coat of shellac before you put on the poly, it will seal the wood and make it a lot easier to get an even finish. The other option for the future is several coats of wiping varnish first eg. Danish oil etc. followed by poly. I think you should stop using that spar finish and wipe off anything you can. Let it dry and sand off what ever is left. 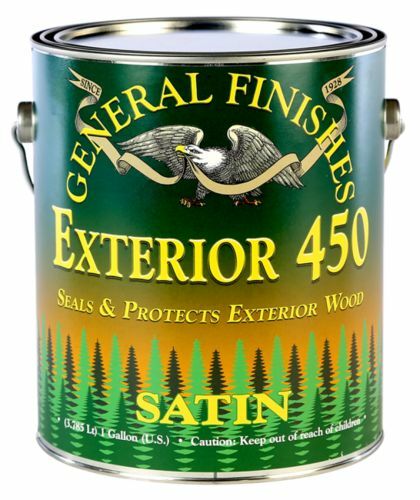 Order some exterior 450 finish from General Finishes. It’s easy to apply a lot easier than spar varnish. Now isn’t that a great looking can. That’s interesting on the thinner part. As for what’s happening I bet that the wood pours are absorbing in the liquid. Do not apply finishes quickly. Give at least 1 day before applying the next layer. This will guarantee that the wood is satisfied soaking in any liquids. If it is too watery, then most likely it is being soaked into the wood. Try thicker coats would be my suggestion. If this does not work, you can sand it down with 220 grit and then apply a new layer to remedy it. Definitely a learning experience, and I think the current answer is to continue the effort of slowly building up the layers in aim to get something more uniform to pull through – somewhat following Manitario’s advice as this may just be an exercise in patience. I am just reluctant to throw the time into it if its something that can be mitigated. I have certainly been cognizant of dry times and allowed for 24-48 hours plus between coats. However, I have still had my sandpaper clog after several of the coats (like the finish is still wet) despite living in Southern California where the temperatures rarely drop below 65 and humidity is almost always low…. so another point against this finish in my books. 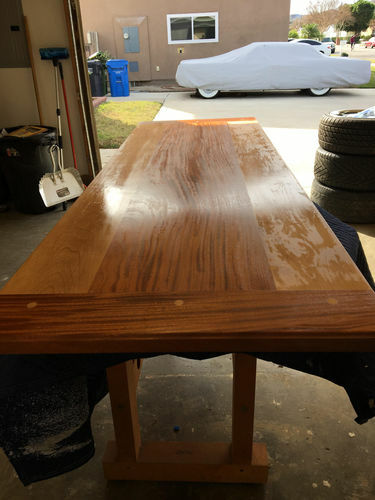 I will definitely be using a General Finishes sealer in my next projects as it seems like most of what I have read has been exceptionally positive. Additionally, some prep work to better seal the wood before starting down the finishing route is a good point as well. However, with the current project I am reluctant to pull off what is there to start over and then potentially walk into a situation where the two finishes don’t play nice with one another (assuming I am unable to get a complete removal). I had good luck with wet sanding with 400 grit wet/dry paper while applying a wiping varnish. I was using General Finishes Arm-R-Seal, I flooded the surface with the finish, then took the paper and lightly sanded, being sure to go in swirls to spread the ‘dust’ everywhere. Then I took a rag and wiped the surface lightly to pull all the dust off that wasn’t lodged in the pores. It wasn’t perfect but it did a REALLY good job of pore filling without looking like “plastic”. This was on some black walnut. 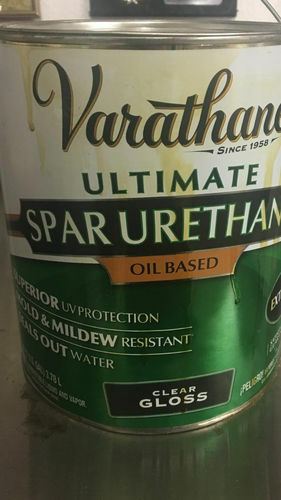 Isn’t Varathane a water based product?? Isn t Varathane a water based product?? Pretty sure it comes in both water and oil based versions. 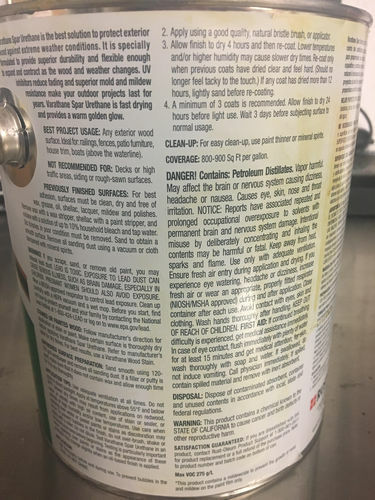 1st thing is to read the can and figure out what you have. It will list the proper thinner to use. Lacquer thinner and mineral spirits are not interchangeable. The table doesn’t look like an outside table. If this is true, spar varnish isn’t a good choice. It is formulated to be softer and more pliable than interior varnish to compensate for the dimensional changes when wood is wet and dried. Is this finish water reducible material? Lacquer thinner is a very bad idea in either case and can ruin the properties of the material. One should always read the directions when trying a new finish. The only reason to add thinner to spar varnish is to get it more open time. So the brush marks or any bubbles can pop. I stopped using it at least 10 years ago since they changed to formula.Im also in California so I just stick to General finish. The way your building a top coat will take months to have anything close to brushing out three coats. That’s why I suggested starting over. I have to apologize, I had previously mentioned that I was thinning with lacquer thinner, but that simply was not the case. I have in fact been using mineral spirits, and the wipe down we see in the picture above is due to mineral spirits as well (Whoops!). A bit more clarification on the finish that is on there, it is in-fact oil based and cleanup recommendations are with paint thinner or mineral spirits. ArtMann’s feedback on Spar has me a bit nervous now since this will be an outside table (albeit living under a covered patio so mainly need to avoid moisture over UV). Perhaps I do pull all the finish and start fresh with some General Finishes. Photos included of current finish for clarification. It’s a outdoor finish it says. It’s just the way your applying it that makes it weak. Your varnish choice is fine, you are just thinning it a little bit too much, allow it to dry thoroughly, sand in between coats and once you get the build up you want, rub it down, no easy way around a good finish. Lacquer thinner is too “HOT” ( harsh), for a varnish, it can burn the resins and weaken it . Mineral Spirits is what you want, give it a good coat out of the can and let it dry several days. Then using some 320 do a light random orbit sand, ...It should be creating a white dust when you sand , if not let it dry longer . African Mahogany is very porous and will soak finish like a sponge , therefor you have to let the first coat dry thoroughly , so subsequent coats “build” and are not further absorbed. Last point .. finish both sides, bottom doesn’t need as many coats as the top , but it does need sealed well to balance .